HUCK CUP & Mike Brown Memorial – Rundown & Results – Mewse was motoring! 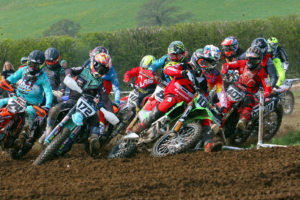 The damp and dreary weather did it’s best to halt the machines and racers who gathered today (Good Friday) to compete for the Mike Brown Memorial Trophy and the Huck Cup at Marshfield. 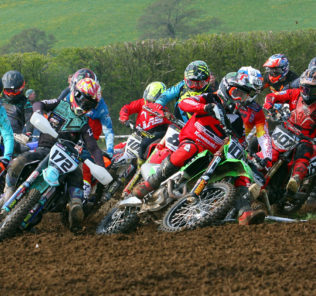 In it’s second year of inception the Huck Cup, in memory of Mark Hucklebridge, drew in a class line up of British MX stars but with the first round of the Maxxis British Motocross Championships just a few days away on Easter Sunday there were a few notable no shows. was British MX1 Champ Graeme Irwin who had pulled into the lead and was stretching his gap at the front of the pack. Hawkins soon came under fire from local boy come good Conrad Mewse, but Hawkins made it hard work for him which helped Ryan Houghton who had to fight through the pack, catch up on the pair. Once through Mewse pulled clear but was unable to catch Irwin who went on to take P1 in race one, with Mewse second, Houghton third and Hawkins fourth. Josh Waterman rode well for 5th, and Shane Carless put in some good laps for 6th. Best of the Vets in Race 1 was local favourite Tom Church in 11th with the ultra smooth Josh Coppins in 13th. With the conditions and weather worsening the line up for race two was down to 12 and once again it was the sharp starting Luke Hawkins who got to the front followed by Waterman and Mewse. Mewse was looking determined and pulled through to the front, with both Waterman and Hawkins disappearing with the latter pulling out, and Waterman coming back into play in 5th behind Todd Kellett. Now Graeme Irwin was on the chase and closing on the leader Mewse, with Houghton fighting through the pack to third again. Irwin applied the pressure at the front but Mewse held his nerve and went on to win the race and the coveted Huck Cup, with Irwin second, Houghton third, Kellett in 4th and Waterman 5th. The only Vet to continue to circulate in Race 2 was double British Champion Stephen Sword who ended up in 8th. So it was Conrad Mewse who lifted the huge trophy, and win the overall from Irwin in 2nd, Houghton 3rd and a hugely credible 4th for Josh Waterman who also lifted the Buzby cup for the most Determination shown! In the Mike Brown Memorial race James Barker went home with the win after having two strong moto’s and doggedly ploughing through the mud to finish up the field each time. Cameron Curtis was second whilst Billy Saunders was third. The line up’s in the other classes thinned down massively as the day went on so all credit to those who stuck it out for the long haul. Mark Young won both the Expert races to also take the overall, Kyle Procter won the Seniors due to a last race win over runner up Max Luckes. In the Junior MX1 class the win went to Roddy Howard with only him and one other finishing both moto’s in this group such was the tough nature of the conditions. Tom Simpson did the Double moto win thing in the Junior MX2 class with Stuart Harrow second and Mike Harrow third. All in all an enjoyable day, although a wet and cold one, though the main thing is the names of Mike Brown and Mark Hucklebridge live on in the World of Motocross and quite rightly so. The Stars are out on Good Friday for the Huck Cup including Coppins, Mewse, Whatley, EBB, Nicholls..